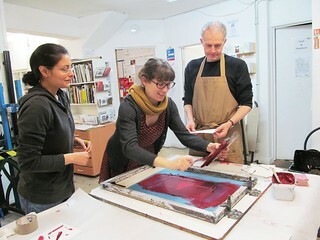 In addition to our course programme we also offer bespoke courses for groups and organisations in our Leicester studio. This type of learning experience is ideal if you want to attend a course with a group of friends or colleagues, such as for a team building day or a hen party. Group teaching can be booked in any time, just contact us to see what we have available. We offer courses in all techniques, for group sizes of between 2 – 8 people. All prices include materials. For more information, to discuss options and to get a quote please contact us or call 0116 251 4174. Back to the Education page.